In this blog post, I review Skywok, a new fine dining Indo Chinese restaurant in Park Inn By Radisson New Delhi IP Extension. Hand on heart - how far would you be willing to go to entice your taste buds? Well, I recently traveled two hours by road - from Gurgaon to Patparganj - to savor the best Chinese delicacies at Park Inn by Radisson IP Extension, who are now serving exclusive Chinese food on a platter at their newly launched outlet, Skywok. I don't intend to let the cat out of the bag but perched on the terrace, the restaurant overlooks the beautiful Delhi skyline, making it ideal for a romantic dinner date. The interiors are subtly etched with mystical Chinese characters, dimly lit by contemporary Chinese lanterns, and punctuated by classic tones of red and gold captured in a dramatic modern artwork. The good news is that alfresco poolside seating is also available; enjoy splendid views of the city, sipping your favorite drinks and listening to immersive soulful music - an experience you'll cherish for a long long time. A part of the exquisite dining options from Park Inn by Radisson, Skywok has the most luscious Chinese food cooked with a hint of flavorful Indian spices. From Kung Pao Chicken to Bang Bang Shrimps, the food is cooked and served with utmost love and care, keeping in mind the fiery flavors of Chinese cuisine aimed at discerning Indian audience. The kitchen is in the capable hands of Chef Ravi Kumar, who hails from Aligarh, Uttar Pradesh. He has seven years of F&B experience, having worked for reputed brands like The Piccadily (Lucknow), Park Plaza (Delhi CBD Shahdara), Lemon Tree Hotel (East Delhi Mall), etc. Chef Ravi believes in the freshness of food - delicately spiced and succulently tender - retaining all its juices and flavors while making sure to employ the choicest spices and ingredients. The menu includes various Skywok specials including Udon Noodle Soup, Steamed Fish in Oyster Sauce, Wok Tossed Chicken in Hunan Sauce, Bang Bang Shrimps, Fried Rice with Burnt Garlic, and sumptuous dim sum. 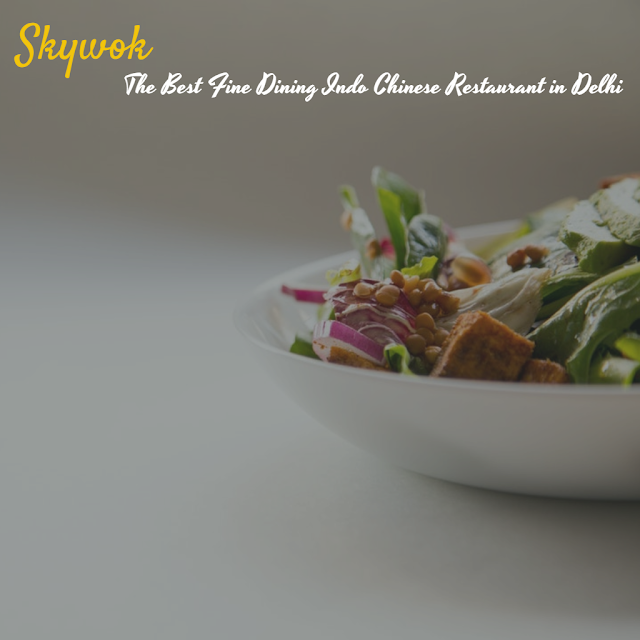 Here are my recommendations at Skywok. You'll absolutely love the savory broth with chicken wontons or assorted vegetables. Crispy spring rolls stuffed with chicken and cheese. Best served with sweet chili sauce. These crumb fried shrimps are literally to die for! Tossed in Chef's special Bang Bang sauce. This stir-fried chicken will manage to leave a lasting impression on your taste buds! Tossed in tangy sauce and topped with nuts. This batter-fried chicken is my favorite dish at Skywok and rightly so! Tossed with bell peppers in Hunan sauce. Craving for something extra sweet? Then go for this bread coated butterscotch ice-cream, fried and served with exotic fruits. This quirky dessert is actually stuffed chocolate fried dumplings served with ice-cream. Finally, truth be told, Skywok is most definitely a 10/10 property, magnificent in every sense of the word.